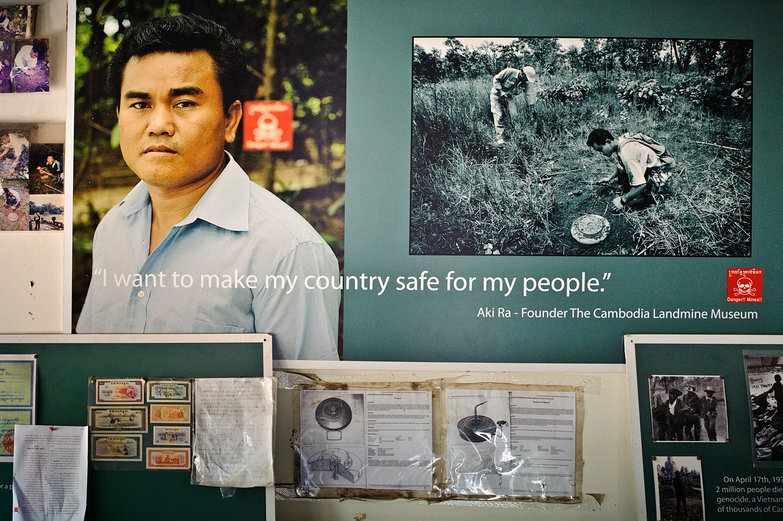 On our ride home from Banteay Srei a few days ago, we took a break from our idyllic pastoral surroundings, and paid a visit to the Cambodian Landmine Museum, founded by a former Khmer Rouge child solider, Aki Ra. 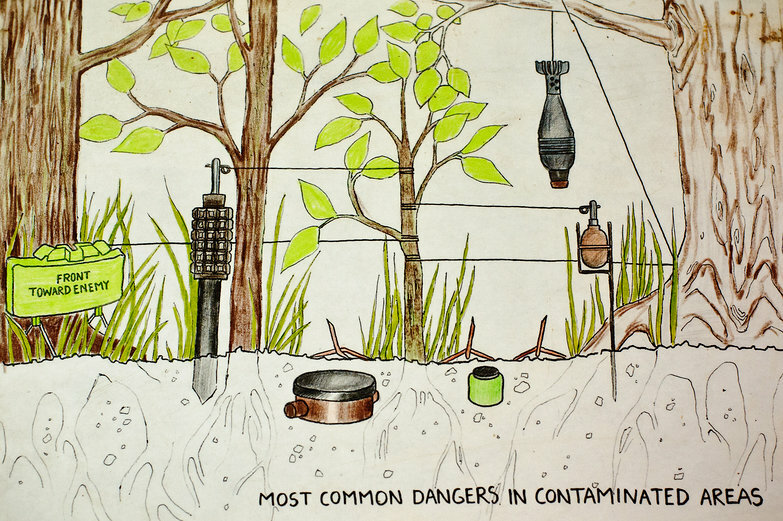 An estimated four to six million landmines were laid during the Cambodian Civil War, though, as records were never kept, that number could be as high as ten million. Writing about this experience is difficult, in part because it was so awful, and also because writing accurately about the circumstances surrounding the political and social climate which gave rise to the conflict are probably beyond our grasp without serious research. Grossly simplified, the Khmer Rouge's horrific four year reign (1975-1979) can be accounted thusly: They ruthlessly executed millions of Cambodians with their woefully misguided attempts to create agrarian socialist utopia. They did so by systematically murdering anyone who was known to be educated, or caught exercising what they deemed to be independent thought. The regime, also known as the Communist Party of Kampuchea's was led by Pol Pot, who, paradoxically, was a member of the educated middle class. In the end, a quarter of the country's population was exterminated, and much of Cambodia's rich culture was nearly lost. 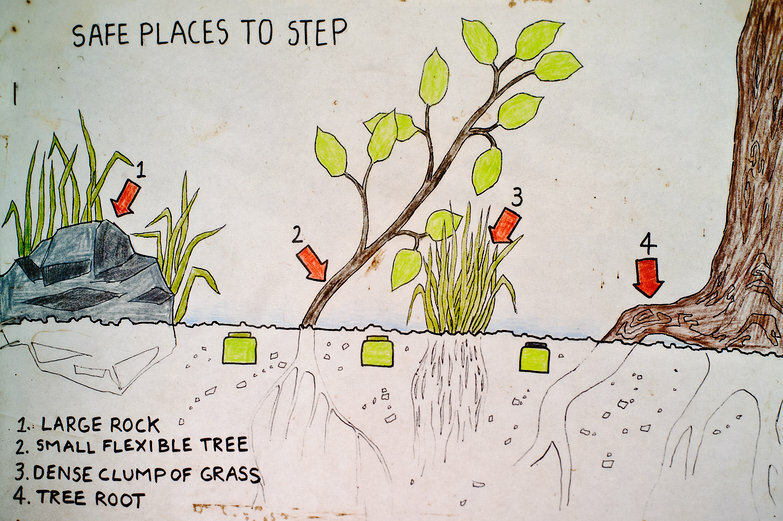 The North Vietnamese army laid the first landmines in Cambodia in 1967, and continued to do so throughout the Vietnam War period to protect bases and supply routes, which they established along the border on Cambodian territory. The United States responded with covert operations from 1969 to 1973, dropping tons of bombs and laying mines well within neutral Cambodia. Following the coup by General Lon Nol against Prince Norodom Sihanouk in 1970, war between Khmer Rouge forces and the US-backed Lon Nol regime brought conflict and landmines to the rest of Cambodia. The Khmer Rouge used landmines for military purposes and to seal off their harsh agricultural cooperatives in "liberated" zones. Lon Nol forces relied heavily on mines towards the end of the war to beef up defenses. While in power from 1975 to 1979, the Khmer Rouge used mines extensively along the borders with Vietnam and Thailand, turning the country into what was called a "prison without walls". After 1979 guerrilla warfare continued. Mines were extensively deployed by all groups across very fluid battle lines as a weapon of choice to protect territory, channel enemy forces to vulnerable positions, and demoralize communities. Starting in 1985, millions of mines were laid in a 600-kilometer barrier along the Thai border under the notorious K5 conscription program. A major episode of mine laying followed the withdrawal of Vietnamese troops in September 1989, in the military power vacuum that resulted. Government forces laid an enormous quantity of mines to hold back resistance forces on the Thai border. Resistance fighters in turn launched an offensive bigger than any in the war prior to this, and laid mines deep within the country. 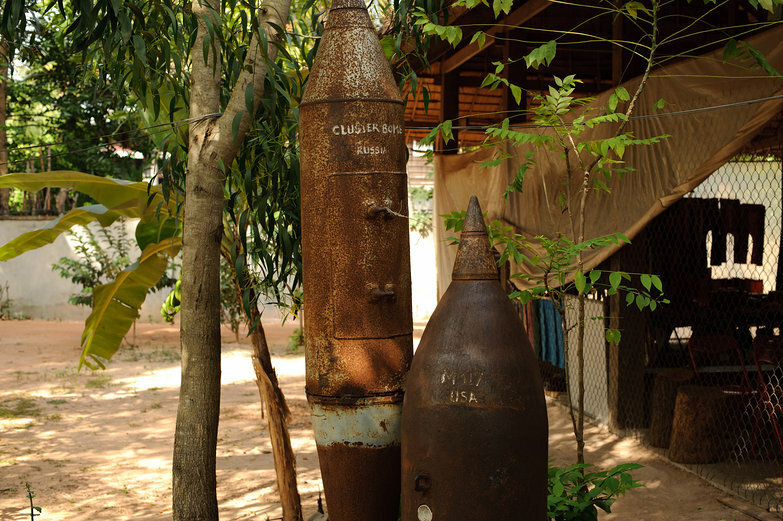 Mines continued to be employed by the Khmer Rouge and by Government forces even after the 1993 elections. At the age of ten, I was given my first gun. The gun was an AK-47 and it was more or less the same size as me, so I had a hard time finding a way to carry it over my soldier. It took me a little time to get used to its weight and kickback when I fired it. I fought for the Khmer Rouge until I defected to the Vietnamese army. This was in the early 1980s, and I was still a child. As I was one of the newer soliders in my unit, I was required to go out at night and hunt for food. We hunted with our regular weapons, AK-47s or M-16s. When I would go into the jungle to hunt, I somtimes ran into my friends from the Khmer Rouge, children like myself, who I had grown up with, who were also hunting for food to eat. We would hunt together, and when we were through, play together. The next day, we would kill each other. Every week there would be a village meeting to decide who had been good and who had been bad. Those who had been bad, for whatever reason, would have their throat slit very slowly with palm fronds. The villagers were forced to cheer and clap as these people were murdered, and they were taught to regard the bad people as the enemy. 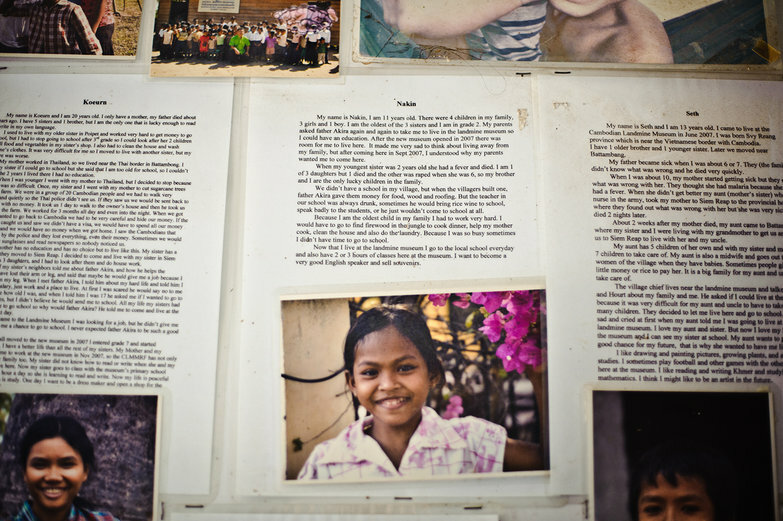 We have only been here a week, but already we're enamored with Cambodia's radiant people. They posses some ineffable quality that we wish was more prevalent in the world. Perhaps the joy they exude, and the immediate respect many of them evoke from us, is borne out of the haunting experiences their people suffered such a short time ago? Being at Aki Ra's museum, watching footage of him clearing mines, and meeting some of the kids he has taken in, was profoundly moving to both of us. As we sat together in the sites's little restaurant (staffed by his kids), talking over lunch, we discussed the growing sense we've had that we want to use the privilege we were born with to effect positive change for those less fortunate. There are no shortage of problems in the world that we could throw money or time into, but we're also keenly aware that many aid opportunities don't actually result in a net change for good, as this article explains so clearly. We're not sure yet what we want to do, but there is most definitely an aid project in our future. 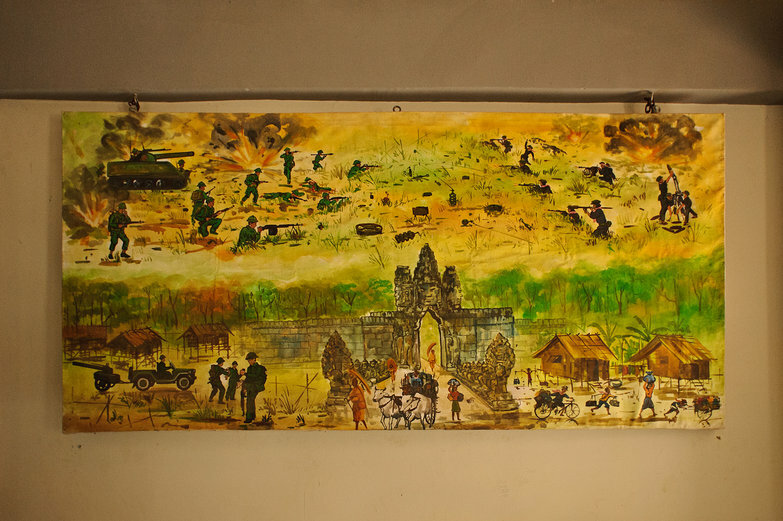 All of the proceeds from our 2011 Cambodia Calendar, plus an equal dollar amount directly from us will be given to Aki Ra's Cambodia Landmine Museum to further his admirable efforts.